Meggie loves stories, but her father, Mo, hasn't read aloud to her since her mother mysteriously disappeared. When a stranger knocks at their door, Mo is forced to reveal an extraordinary secret - when he reads aloud, words come alive, and dangerous characters step out of the pages. Suddenly, Meggie is living the kind of adventure she has only read about in books, but this one will change her life for ever. I had high expectations for Inkheart as I've heard only good about it, but it was nothing more than an average read for me. The story is very innocent and quite possibly I'm simply too old to read it and properly "get" it. However I do not think the intended audience (12-15 year olds maybe?) would find it any more thrilling than I did. The story never really caught proper hold of me, and I think in particular the lack of character developement got to me. They are all very one-sided and it was hard to get to know them properly and thereby like them. Meggie's only real trait seems to be her love of books and she is incredibly passive for a main character. Furthermore the story was very long-winded with hardly any actual action making it a very long book to get through. It could have used some cliff-hangers or any sort of suspense - as it was I could put it down mid-sentence and not think more of it. The plot as such is very generic and from page one you don't doubt the inevitable happy ending. I liked the general storyline and the idea about some people being capable of making books and the stories they contain come to life. However I couldn't ignore a very big bucket of plot holes and ideas that didn't seem properly thought through. As they were a gift, I do have the entire trilogy on my bookshelves and I will eventually read Inkspell and Inkdeath. I am in no rush though and Inkheart works fine as a standalone novel. Also - I can recommend the motion picture Inkheart which is based on the novel. It's a very sweet film starring Brendan Fraser and I must admit I enjoyed it far more than the book, as the film has both action and suspense. Ah, I loved this book! I actually found it really hard to put down and raced through it. Inkspell is of a similar standard, but if you didn't love this one, definitely don't read Inkdeath! hehe yes after hearing you talk about how much you loved it I was quite surprised how little it appealed to me, but oh well ^^ I have been told that Inkspell is better than Inkheart and that Inkdeath really is death/dead-boring. Best book ever!!!!!!!!!!! I dont know why you dont like it... And Inkdeath is NOT BORING but nearly better than Inkheat!!!!!!!!!!!!!!!!!!!!!!!!!!!!!!!!!!! I couldn't put this one down, but like I said I still haven't managed to make it through the second book. I really enjoyed this whole series! 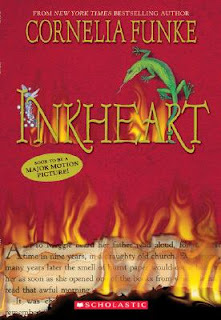 I loved Inkheart!